Fender is a name that has been in my family for a long time. Back when I was just a wee little person, I’d see my older brother play on his Fender Stratocaster, doing his best to keep up with the greats like Jimi Hendrix and others. When I got older, he passed that same guitar down to me, and I still have it to this day. There’s no reason to replace a solid piece of wood. 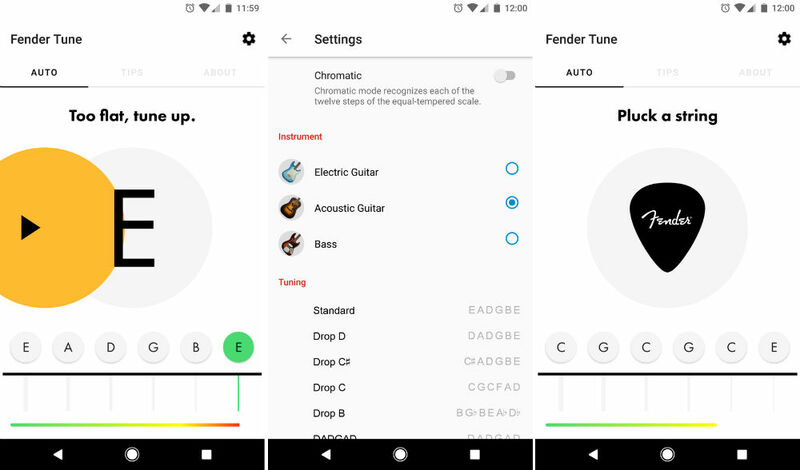 Anyway, point being, a name like Fender carries much weight with guitarists, and players will be happy to learn that the company has released an official guitar tuner application for Android. Looking past the name, the tuner works quite well on the phone I tested it on (Pixel XL). I strapped on a few of my axes and got them tuned up, really enjoying the visual aid the app provides with regard to whether a note was flat or sharp. It also did a great job at automatically recognizing which string I was plucking, making the process take just a few seconds. Beyond your Standard E tuning, the app also allows for alternative tunings, such as Drop tunings (D, C, C#, and B, perfect for all you metalheads), half step down and full step down tunings, plus Open tunings (C, D, E, F, G, and A). Most importantly, the app is completely free and features no advertisements. Major bonus.